After three weeks of filming, re-filming, editing, voiceover work and other tweaks the Final Video and Sound Movie is complete! The team( Eva Jenny, and myself) went through the full spectrum of loving and hating the project before its completion But here it is! The movie’s plot stayed the same to that of the initial storyboard with some tweaking to shots and addition of some extra factors. The plot was that a young couple would be going on a date around Brooklyn and then as they’re eating at a cafe, they watch a person throw trash on the ground but they don’t do anything about it. After this there is a comical spiral of events involving trash until the climax. For the video, each of us took turns in the major roles and had a say in the creative direction of the piece. Jenny and Eva agreed to be the couple for the film which was great. Jenny was also the main editor for the piece, Eva did a majority of the creative direction, and I did the videography and a lot of the site planning. The issues that the team ran into were largely logistical. Since the concept for the movie required shooting in multiple outdoor locations in Brooklyn, that meant we had to plan the shooting schedule well enough to budget for any problems that could arrive. It turned out that we didn’t do an amazing job at that, weather was also a factor, so we had to spend two more days than planned shooting the movie. There was a lot of worry about the plot and making sure that the story came across the way we intended it to. A lot of our worries were able to be fixed in post. On top of this though, I learned how important it is to do multiple takes from different angles. I spent some time beating myself up for not doing enough takes at a few of the spots or taking shots from areas that would change the perspective. But you live and you learn and I’m glad the process happened and I’m quite happy with the result. For our storyboard, we decided to send a message about how important it is to properly throw away trash and recycle. Our story will follow a couple on a date through New York City. On their way, they experience gradually worse examples of people not caring about how they remove their trash. The film will begin with scenic images of the couple sitting in places like the Brooklyn Bridge Park and Prospect Park. Then they will witness someone eating and tossing wrappers and food on the ground. They are bothered by this but choose to ignore them and continue on their date. The scenery gradually changes from beautiful images of the city to trash-filled examples of the city. Their date ends at trash-filled stoop. They have to climb up their stoop over the piles of trash. As they climb, the film rewinds to the scene of the person dropping wrappers on the floor. This time the couple confronts this person and asks them to put their trash into a receptacle. The film ends with a message on the screen about our future and the importance of getting rid of trash properly. For this project we each decided that it was important to make something impactful but also had elements of satire and implemented enjoyable stylistic elements. Having the couple spend their day in South Brooklyn areas like seemed fitting as the area has a contrast up upscale neighborhoods like Brooklyn Heights, and areas that are in the process of changing and being cleaned up, like Gowanus. Below are the shots used for each scene. Focusing on simple shots that highlight the deterioration of the environment around the characters is important for this piece. The shots, and scenes also need to have a visual appeal that makes the snowball effect of the trash have the satirical impact desired by the piece. A little under a week after finishing the 4 minute sound walk about a sleep deprived person navigating a day at ITP, I’ve had some time to reflect on the walk and peer commentary about it. A lot of the thought in planning and recording the walk went into the idea that it would be a solo experience. Neither my teammates nor I had planned on what would happen if a group did the walk together. This new dynamic made some issues with the walk and documentation apparent. It was pointed out that having a map made people too reliant on using it and even confused some people. So if the walk was to ever be done again we would not give out a map and only give a short written guide like the one below. One of the issues that we had when recording the walk was how the transition from outside to inside was not immediately clear. So when a group of people did the walk together that doubt was made more apparent. Coinciding with that, Marina pointed out that there was no set beginning to the walk. For some reason it didn’t come up when our group was planning and was left as an oversight in the end. Looking back I would have liked to have thought through a beginning to the walk that was analogous to the ending in terms of its abruptness. One last thing that I would do differently for the next time is to have outside users test the walk more. Not just listen to it, but actually do the walk and then give feedback. It became obvious after hearing what everyone had to say about the walk that the theme came across well and that the walk was enjoyable. I think that the walk had elements that really helped immerse people in the main character’s mental state. The addition of the heavy distortion on the sounds towards the end, after the locker scene, really helped to amplify the experience and make it more interesting. It was interesting hearing some people say that they enjoyed the pacing and others not enjoying it. For us the pacing felt like it was a part of the distortion and general uneasiness of the walk from the main character’s perspective. As far as the work goes, everyone on the team was open to trying different parts of the editing, recording, and ideation which really came across in the final product. Even with the small issues in the final product I believe that with the time allotted it was a success and truly enjoyable. Insomnia is a POV sound walk from the perspective of a sleepy/almost delirious student entering into Tisch and going about their day before heading to class at ITP. The project was created in collaboration with Anna Oh and Timothy Lobiak. During the course of the walk the listener will experience everyday interactions and sounds through this distorted lens. The intended effect being that the user feels as if they are sleepy and easily susceptible to overstimulation. Using the provided map listeners will stop in specific locations that the narrator has his interactions at. Following the initial recording of sounds from the first assignment, week two involved more emphasis on learning the fundamentals of Adobe Audition, and flushing out ways to make the narrative more engaging to the listener. 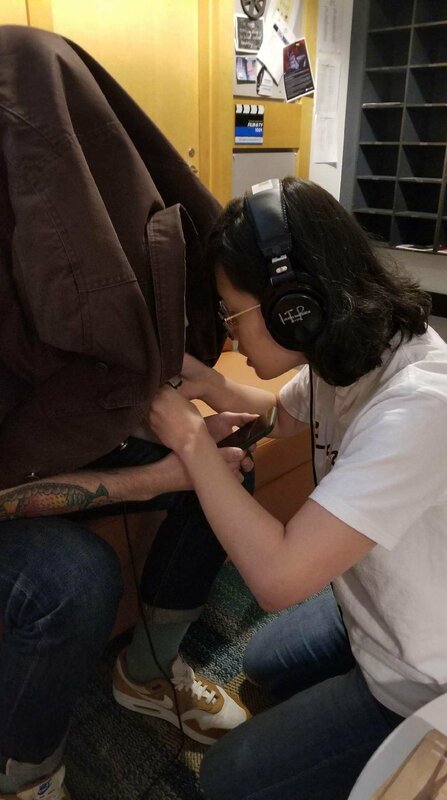 After the initial interaction with Audition, Anna, Timothy, and I realized that we would need to dedicate more time to recording extra effects and transitions. The idea of making normal sounds, such as people talking or lockers opening, more intense was brought up. As was adding some surreal elements to the piece to really exaggerate the fact the the main character was borderline delirious. After some badgering, I agreed to be the voice of the main character for the project. Tim played the part of the Security Guard, and Anna voiced the friend. We recruited Elvin Ou to voice the professor. We had some of the same issues as the week prior when it came to recording and re-recording sounds. One of the biggest issues was actually editing the whole walk to sound like it was happening in one take. The elevator at the bottom of the building was one of the biggest issues with this. We ended up solving the problem by recording a full walk from the Tisch entrance to the classroom all in one take, early one Sunday morning. Once we recorded the sound this way it was much easier to layer the different sounds and effects on top of the base. After the first Video and Sound class, I decided that I would go through the East Village Poetry Walk, narrated by Jim Jarmusch and a wide range of poets. This particular walk struck a cord with me due to my minor infatuation with the east village and lower east side’s diverse history. The idea that places I have eaten, drank, and walked by numerous times had, at one point, been the hang outs of great writers, poets, and musicians is something that makes the village seem like it transcends time. Even if the places they had written are gone, the locations that that they had those ideas were still alive and could give inspiration to new people looking for it. Most of all, the walk taught me new things about an area I have spent many hours in and gave me new historical information and facts that can help change perspectives about NYC. After the walk, I began working with my team to figure out a narrative for our own sound walk. We went through a list of possibilities and finally settled on a narrative that we felt would be interesting to the listener. After planning out the locations, characters, and sounds we began to record using the Zoom recorder. The recording process was difficult due to a wide variety of external noises that caused problems with each audio piece. After multiple takes of each sound bite we felt that we had recorded enough that we were happy with.